Episode 3, "Chance Meeting" Episode 3, "Chance Meeting"
The above info came from Elwin Blaine Coldiron, and was edited by yours truly (contact me). 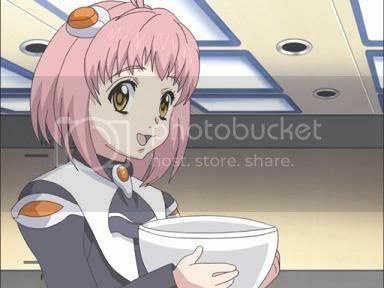 The image came from photobucket. The prototype of the 100-series observational Realian series, known as MOMO, is possibly the most sought-after object in the galaxy. One of the last projects undertaken by Joachim Mizrahi, MOMO is modeled after Joachim and Juli Mizrahi's late daughter Sakura (Juli, incensed by what she believed is her ex-husband's attempt to resurrect their daughter, had rejected the Realian, but now seeks her for what is revealed next). Although she is blissfully unaware of her importance, MOMO is believed to have programmed into her database the Y-Data, which reveals the location of the Zohar, believed sealed away by Joachim Mizrahi before his death. 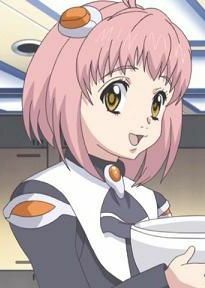 MOMO was held prisoner by U-TIC, which sought the data, on their base in Pleroma, when she was rescued by Ziggarat-8, whom she nicknamed 'Ziggy', mostly because she didn't like the cyborg's designation. Ziggy then took MOMO to the waiting starship Elsa Von Brabant, where Ziggy had contracted Captain Matthews to take the Realian to Second Milta. However, along the way, the Elsa had picked up survivors from the Gnosis attack on the Woglinde Armada – Shion Uzuki, Allen Ridgeley, Lt. Louis Virgil – and KOS-MOS, who were on their way to Second Milta anyway. But KOS-MOS – operating under secret protocols by Vector Heavy Industrial – sabotages the engines of the Elsa, forcing the ship to accept aid from the Kukai Foundation, which later gathers the Zohar Emulator that the Woglinde picked-up prior to the Gnosis attack. The Elsa crew, the Woglinde survivors, the Kukai Foundation would soon find themselves in a power play between the Galactic Federation and U-TIC... as well as the secret manipulations by Albedo Piazzolla. And all for obtaining MOMO and the secret within her.